Tokyo has a surprising number of amazing bakeries. Some of France’s top boulangeries have set up shop in this country whose meal is based on a bowl of rice. Here are some of my favorite bakeries in the capital city. This article originally appeared in Metropolis magazine. My first Japanese sandwich, some 30 years ago, was a revelation: egg salad simply flavored with a bit of mayonnaise and neatly tucked into some Wonder-like white bread. Even at age 6, I was quick to notice that the bread lacked crusts. Someone had actually gone to the effort of cutting off the crusts! It was the perfect sandwich. Why hadn’t the Americans caught on to this? I dreamed of having crustless sandwiches for my school lunch and being the envy of my friends. Sadly, my mother disagreed, and my sandwich paradise was as short-lived as our holidays in Japan. My passion for bread continued, however, and I even spent six weeks doing an intensive artisanal bread course at the French Culinary Institute in New York. Times have changed, but those crustless wonders are still available at convenience stores. Even more uniquely Japanese is the cornucopia of oyatsu-pan, or bread snacks. My favorite is mentaiko-pan of spicy fish eggs smeared onto a baguette and toasted crisp. Curry-pan is a piece of dough stuffed with savory curry and deep-fried like a doughnut. Some are a mystery to me, such as melon-pan, a large fluffy piece of bread draped in a melon-flavored, sugar-like frosting. Others curious creations incorporate yakisoba, croquettes, and fruit with whipped cream. Luckily, our options are not limited to corn and mayonnaise drizzled with cheese. There are world-class bakeries in Tokyo serving flakey and buttery croissants, crusty baguettes, light focaccia and, for those with a sweet tooth, wonderful selections of pastries. Across the street from the Bunkamura in Shibuya, Viron has authentic French sandwiches of pork rillettes, paté de campagne, and ham and Gruyere. The flour, brought in from France, is key to their famous Retrodor baguettes. If you are going to explore one new bakery, this should be it. Rumor has it another branch will open in Marunouchi later this year. At Maison Kayser you will find what the French say is the perfect croissant, as well as other classic French breads. They have a café in the basement of Coredo Nihonbashi and a number of department stores. For exquisite ficelles, or mini-baguettes, and perfectly hand-shaped breads, head to L’Atelier du Joel Robuchon at Roppongi Hills. Be sure to pick up a tart au citron. This is just a small selection of Tokyo’s finest bakeries. Others include Burdigala in Hiroo, Trois Grois in Shinjuku’s Odakyu department store, and Garbagnati Milano in Roppongi. 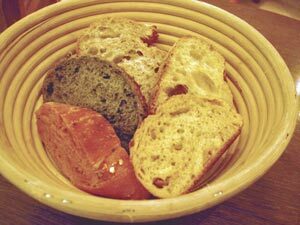 There are also artisanal bakeries such as Levain in Tomigaya and Juchheim die Meister in the basement of the Marunouchi Building, where you get hearty, rustic breads to really dig your teeth into. Of course, good bread is not all European, but I’m still looking for the perfect bagel and an authentic banh mi, a Vietnamese sandwich that has become a hit in New York. It’s a baguette loaded with vegetables and meat, with tastes that explode in your mouth—sweet, salty and savory combined. Life is too short to eat bad bread, and thankfully the Atkins diet never quite caught on here. So, when you are sick of slurping soba and your eyes roll at the idea of another onigiri, indulge at the bakery. These days, my taste in sandwiches has graduated to the Viron or Robuchon level. However, after a night on the town, the combini crustless wonders still taste as good as they did when I was six.